I enjoy building and flying fighter kites. They’ve been a source of great joy for me over the years. The Dragonfly Fighter is my first fighter kite design. In fact, I used one to win my very first official fighter kite match. 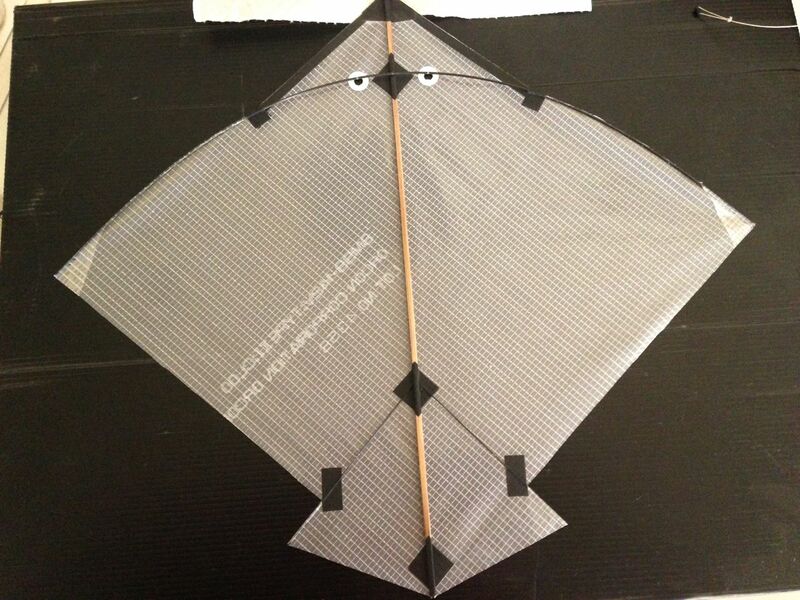 This is a small fighter kite; it has a 16 inch spine length and an 18 inch wingspan. It flies well in winds between 4 and 10 miles per hour. It isn’t the fastest of fighters, but it’s simple to construct, tracks well, and is very controllable. If you’re flying a line touch competition, speed is great, but control is better. The trailing edge is curved, which reduces sail flutter. I built this example out of mylar, with a carbon rod for the bow and a bamboo spine. You can get the materials you’ll need from kite shops, as well as hardware stores, hobby stores, or on-line from kite retailers. I designed the Dragonfly to have the bow glued into the sail. I use a .05 graphite rod for the bow, and I shape my own bamboo spines. I make a half pattern out of poster board, as shown below. A line drawn between the wingtips will cross the spine 1″ above the spine center. The bow will cross the spine 2.5″ below the nose of the kite. Pattern, tools, contact cement, sail material and bamboo I shaped for the spine. The half pattern ensures sail symmetry. Fold the sail material in half, smooth it out and tape it to your work surface. 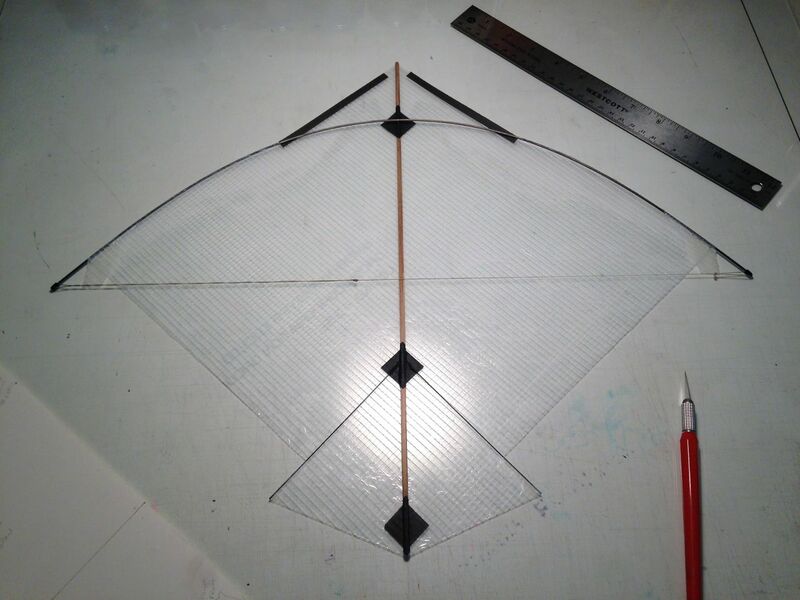 I use a sheet of tempered glass on my drafting table to build my kites on. Cut carefully around the template, using rulers as needed to make a smooth edge. When using mylar or paper, if you nick the edge of the sail , it creates a weak spot that can tear from the edge toward the center of the kite when it’s out in the wind, so be careful and steady and use a sharp blade. The sail, once cut out, is symmetrical and the material will be surprisingly strong. Once the sail is cut, I spray some water on the glass, and use an old business card to smooth the sail down on my glass work surface, then dry off the excess. In the example above, the front side of the mylar is red, and the back is silver. You have to build it red side down. The first thing to go on the sail is a 5.5″ by 1/4″ piece of clear packing tape which goes from the shoulder point carefully along the leading edge toward the nose on each side. The ends by the nose will be trapped by the nose reinforcements, and the other ends are covered by a reinforcement over the shoulders. This tape stiffens and strengthens the leading edge and reduces flutter. The sail smoothed down on the work surface, with the leading edge reinforced with tape, and the bow installed. I use a bow setter to get the right curve to my bows. All a bow setter is is a length of line with an end cap at one end, another end cap on the line, and a moveable knot in the middle between the caps. The ends of the bow go into the caps, and the knot is moved until the bend in the bow is the desired shape. I like to make sure that the bow bends in a “natural” spot, since round graphite rods aren’t always as round as they could be, and they will prefer to flex more easily in a particular way. You can see the bow setter’s moveable knot in the picture above, but the end caps are trapped under weights. Contact cement is applied to the area of the bow that contacts the sail, and the sail itself where the bow is installed. I use wedge shaped makeup sponges to carefully apply contact cement. I have some extra material at the edge of the pattern to fold over and cement down at the wingtip. Using several careful cuts, I gently slice the extra sail above the bow and fold it smoothly over the bow. 10-12 of these cuts on each side will do. When the contact cement sets, the bow won’t move. As that is drying, I cut the spine to length and install it carefully under the bow. For the spine, I only apply contact cement to the spine itself. Once the spine is in, I weight it down and wait for the cement to dry. The finished sail with the bow and spine cemented in, from the front side. When the cement dries, I remove the sail from the bench. I remove the bow setter, clip off the excess rod from the end, and trim the extra tab material at the wingtips. Next, I measure 1″ along the bow from the center of the spine, and put down a loose leaf page reinforcement beneath the bow. I use this as a guide as I melt through the front of the sail with a soldering iron to make clean and even holes for the yoke line of the three point bridle. When doing this, it’s important not to touch the bow with the tip of your hot soldering iron! When this is done, I put a piece of packing tape over the bow between these holes, and tie the bow down to the spine with a short piece of bridle line, and trim the excess, either fusing it or using super glue on it to make sure the knot is secure. Doing this prevents the bow from moving back an forth and slapping against the spine during flight when you release line, and I think it makes the kite smoother, quicker and more predictable in flight. The back of the finished sail. You can just make out the clear tape reinforcements. The final steps are to place tape reinforcements at the kite’s nose, tail, shoulders, and the point where the lower bridle point will be in your spine. At the shoulder, where the bow enters the leading edge, I put half of a 1/2″ by 1″ piece if packing tape under that area, then fold it over the shoulder and bow and smooth it down on the back side. At the nose, I take a 1″ by 2″ piece of tape, put the nose down over it so that the tape is smooth on the front of the sail, and the nose rests halfway onto the 1″ width of the tape, with one of the long edges under the kite. From the top of the spine, cut the tape outward from either edge of the spine in a wedge shape. Fold that over the top of the spine, and fold the remaining tape over the leading edge and the spine. Both sides should cover the spine. Smooth it down carefully as you do it. The tape is difficult to see in the picture above, but the reinforcement is there, and it makes the kite much more durable. I use a three point bridle, with the yoke like tied to the bow 1″ on either side of the spine. The yoke line is attached to the bow at these places, and stands 3″ from the face of the kite at it’s center. I use gel formula super glue to secure the yoke line to the bow. The third bridle point is on the spine, 4.5″ above the bottom end of the spine. Tie a loop at one end of the other bridle line, and use a prussik knot (wound twice so it will lock down) to connect the lower bridle leg to the yoke line. The other end will be run through the marked ends of the sail at the spine where you put down your tape reinforcement, and tied down. A loop of bridle line can be attached to the long bridle leg using the same knot used to connect the long bridle leg to the yoke line. Then the kite is ready to tune and fly. The Dragonfly has always been fun for me to build and fly. 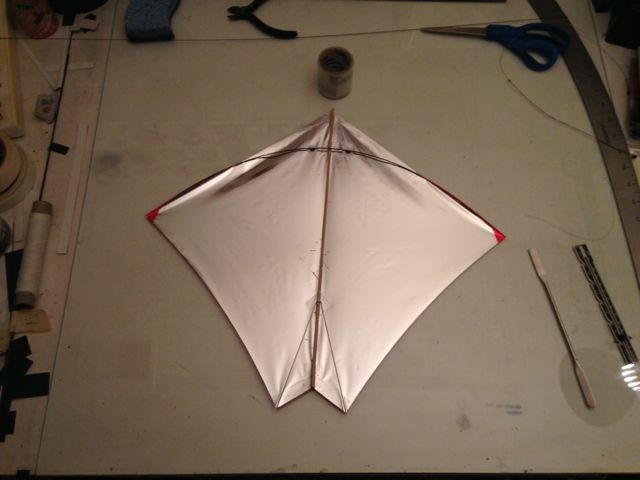 I can build a mylar kite like the one shown here in 3 to 4 hours. That means I can build one in the morning and fly it the same afternoon. They’re durable enough to give you hours of enjoyment. They can be built of more durable materials using the same methods, and they scale up well if you want a larger kite – for a .06 bow, the wingspan can be 20″ and though I’ve never scaled one up that large, a Dragonfly with a 24″ wingspan could use a .07 or possibly a .08 graphite rod for a bow. If you split bamboo for the spine, make sure the spine is strong enough to match your bow. I like the feel of the kite at this small size though. On a light line, it flies beautifully. I hope you enjoy the Dragonfly fighter! This entry was posted in Front Page, Kiting on May 31, 2018 by kitefencer. Every year since 2006, I’ve participated in a unique event. The week before the Cherry Blossom Kite Festival (Formerly the Smithsonian Kite Festival) has been Kite Day at the National Air & Space Museum on the mall. There have been exhibits, kite building for children, and demonstrations of indoor kite flying by some local and some out of town guests. It was always fun to do. Imagine flying a kite inside a famous museum among the exhibits! 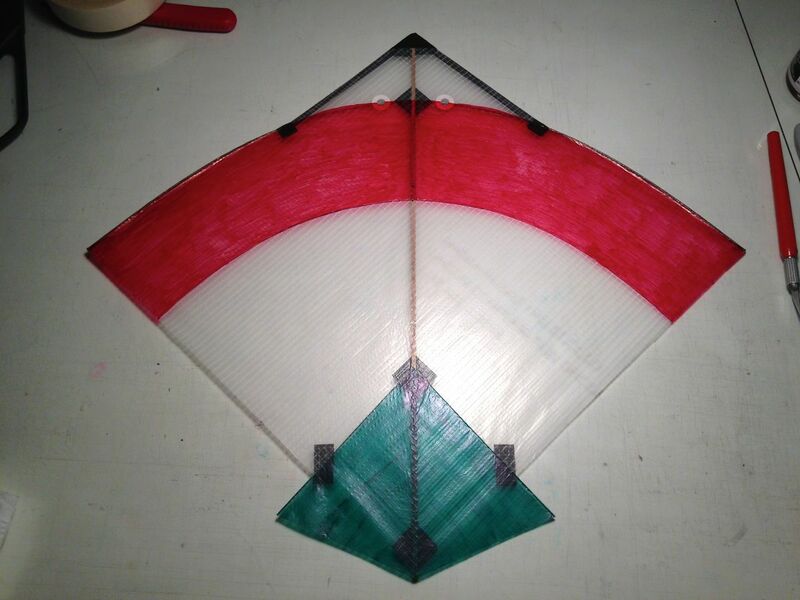 My indoor fighter kite design. This kite flew inside the National Air & Space Museum in 2017. I design my own fighter kites. 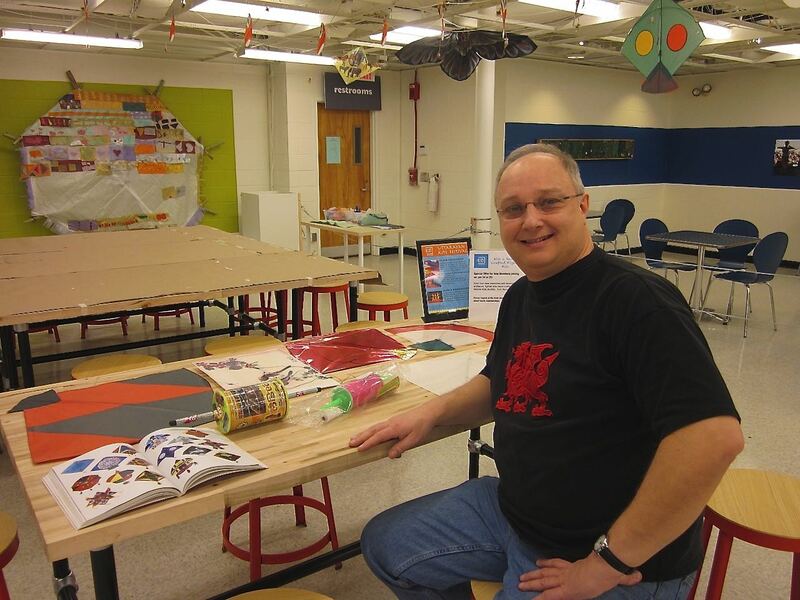 My indoor designs have been flying in different parts of the National Air & Space Museum for the last 11 years. I tried to make my flying a change of pace from the other flyers. Generally, you have to back up to put air pressure on the sail of your kite. It’s best at a constant speed. With my fighter kite, I can also pull on my line to move the kite, so I enjoyed playing faster, more modern tunes and basing my performance on speed. I loved every moment of it. This year, due to budget difficulties, and the desire to fund other priorities, the Museum decided not to hold Kite Day. I hope they resurrect it. I’ll miss that unique opportunity. This entry was posted in Front Page, Kiting on February 4, 2018 by kitefencer. Every year, I’m offered the privilege of participating in with the indoor kiting exhibition at the Smithsonian National Air & Space Museum on the mall in Washington DC. No fans are used; we generate pressure on the sail by walking backward or manipulating the line. Since I build and fly fighter kites, I’m flying on a single line and I can use my feet as well as line manipulation to fly the kite. My flying style is very kinetic; I tend to use faster music to fly to, and more modern music than most. Usually our indoor flyers prefer slower music that keeps a steady pace; many of them are on fixed lines. I like to be a change of pace, moving constantly and quickly. The photo is courtesy of Andrew Albosta. The kite itself is my own indoor design. I use a bamboo spine and a graphite rod as a bow. The sail is made of Orcon, with a curved trailing edge. The kite I used this year (2017) was built the week of the event, and I tuned it before the museum opened and the actual demonstrations began. The photo above was shot at a downward angle from a stairway, but above my head are a few drone aircraft that we had to be careful not to tangle our kites in, and because my line length was always changing, I had to be particularly careful. While this let me fly over the heads of the crowd, it also limited the space I had to work with. It was still a thrill to do. The NASM has been supporting this event for years, and I’ve participated since 2006. It may be threatened by budget cuts eventually, but I find it a unique and pleasurable event to attend, and to say that I’ve had the opportunity to do such a unique thing as fly a kite between the exhibits at a national museum is a rare delight. This entry was posted in Front Page, Kiting on April 8, 2017 by kitefencer. Years ago, quite by accident, I discovered kiting. I love flying kites, and the kite form that I was most fascinated by was the Fighter Kite. Through a combination of research, good luck, and meeting others who found Fighter Kites as fascinating as I did was enough to make building and flying fighter kites a joy and passion for nearly 20 years. I’ve become something of a local authority on these kites. I was recently contacted by my local kite club to see if I would volunteer to help a local museum with their program celebrating Uttarayan, the Indian festival celebrating the turn of the sun Northward. Uttarayan is celebrated in a number of ways, but among them is the flying of Fighter Kites. I eagerly agreed. The Kid Museum is a wonder – it is about experience, and teaching children about science and technical things through experience, all while having fun. Among the ways that the Kid Museum chose to celebrate Uttarayan for the children were dancers performing traditional dances from the Indian province of Gujarat, a gentleman teaching about the Hindi language and helping the children write their names in Hindi, and of course, fighter kite building and fighter kite lore, which I handled with the aid of the Museum’s dedicated and tireless staff. I had a chance to show kites I’d built, and some examples I’d collected over the years, and I talked to adults and children about the way fighter kites fly, and I demonstrated how cutting line works, and of course, I helped the museum in their kite building classes. I had such a good time doing this, and if the Kid Museum wants me to come back and help again, I’d eagerly accept. At my table, showing kites, cutting line, and talking about Fighter Kite culture. 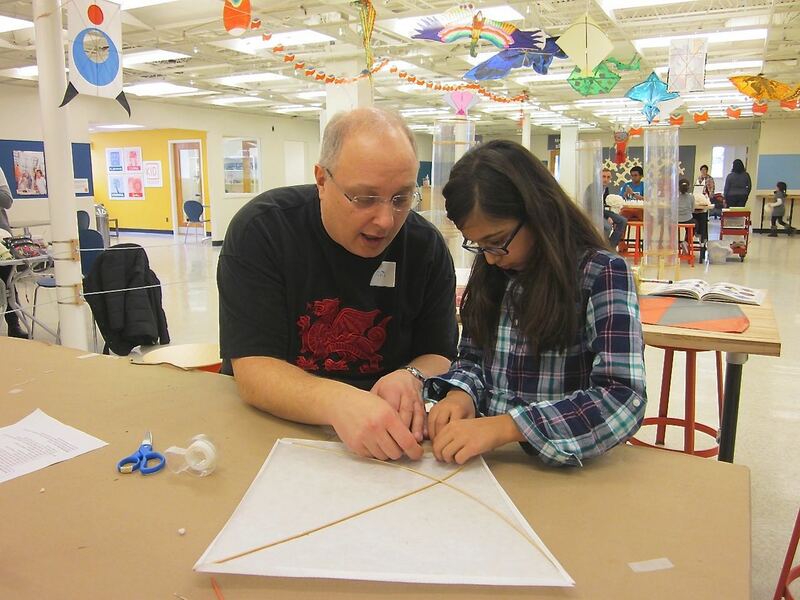 Helping with the kite building classes. This entry was posted in Kiting on February 7, 2015 by kitefencer. Tomorrow I’m going to a Kite Festival in Cambridge, MD. 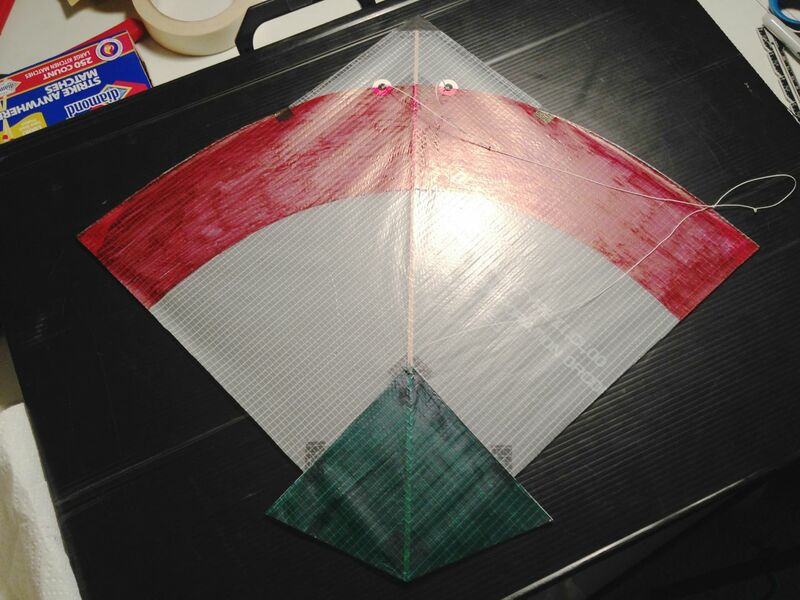 I specialize in designing and building fighter kites, but I wanted to build a new kite to fly. I’ve always liked the look of the classic Indian Patang, with it’s distinctive triangular tail. I’ve designed my own variant. 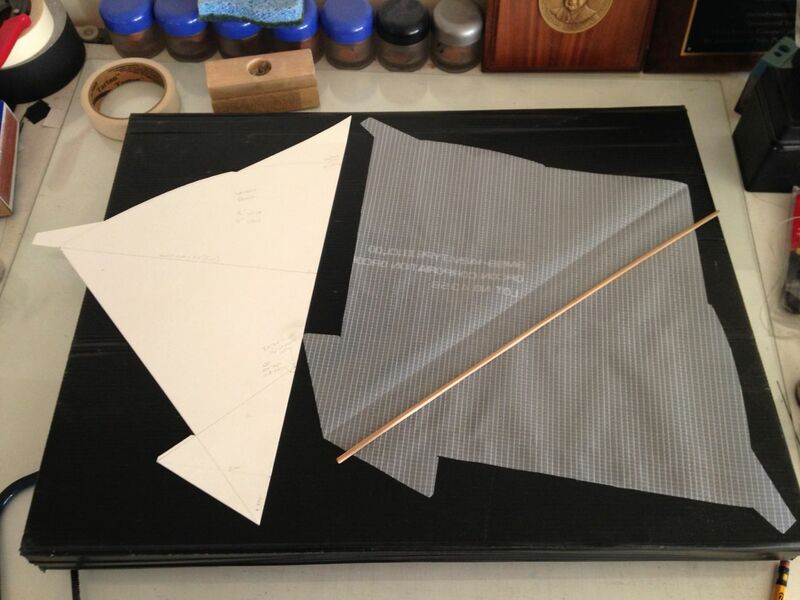 While the classic Indian fighter kite’s tail is a separate piece, my design has a single sheet of sail material. The photo above shows my sail pattern on the left, a hot-cut Orcon sail on the right, and a bamboo spine I split for this kite, and cut down to size. As I built the kite, I smoothed the sail down on a damp sheet of tempered glass. I put reinforcements down at the front edges of the kite above the bow, installed the bow and the spine, and reinforced areas on the spine. I use battens as part of the triangular tail part, and the battens also reinforce the lower bridle point. Once the sail is complete, the nose has been reinforced, as have the shoulder area where the bow is no longer connected to the sail. I’ve also reinforced the battens where the trailing edge of the sail meets the triangular tail part. I used Sharpie markers on the White Orcon Sail. Orcon is a ripstop film that is flexible and strong. This kite has a bamboo spine and a Carbon bow. I used a stiffer bow than I might normally for this design. Usually I use a .05 Carbon Rod for the bow normally, but I’m expecting high winds tomorrow, so I used a .06 Carbon Rod for the bow in this kite, hoping that the stiffer kite will handle high winds better. Now the the kite is finished. You can see from the front that the kite has the profile of a classic indian fighter kite, but the tail is actually part of the sail, and the triangular shape is defined by the sail decoration. The design flies well normally, and I’m expecting good things from this variant. The spine of this design is 16″ long, and the width is 18″. A line drawn between the wingtips (wingtip line) would cross the spine 1/2″ above the spine center. The bow crosses the spine 2.5″ down from the nose. The lower bridle point is 4.75″ from the base of the spine. The battens meet the spine 3/16″ above the lower batten point. This allows the batten ends and the lower bridle point to share the same reinforcement. The battens themselves are .03 Carbon Rods. This design works well using paper or mylar as a sail material. With a .05 Carbon Bow, the wind range is approximately 3-15 mph, with the “sweet spot” at a wind of 5-8 mph. The kite uses a 3 point bridle to adjust for balance and wind speed. This entry was posted in Front Page, Kiting on October 25, 2014 by kitefencer. Many years ago, on a cool morning in late March, I was flying a Firefly fighter that I’d built the night before on kite hill in Magnuson Park in Seattle. A man approached me to ask if he could film me flying my kite. While he said there was no wind, there was actually a very light breeze, but fighter kites fly well in light winds that other kites may not be able to launch in. I thought I’d share that video with you. 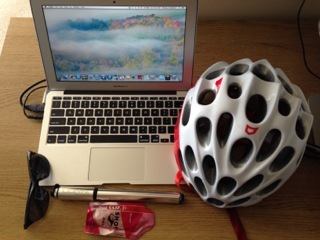 This entry was posted in Kiting on June 5, 2014 by kitefencer. For many years now, I’ve been building and flying fighter kites. To me, they are beautiful in their simplicity and their motion. They can be a thrill when flown on a short line or in competition. They can be a kind of mobile mandala or meditation target when I fly alone. They connect me to the sky. As kites go, fighter kites don’t get a lot of notice. They don’t make a big display and they aren’t easy to capture in photos or film because of their quick, darting flight. They do not pull hard like many multi-line stunt kites. They maneuver on a single line through line tension, and a flyer needs to know when to pull the line and when to give the kite slack line. It’s much like flying a leaf on a thread. They’re not complicated. A simple diamond shape with a spine and a bowed spar from wingtip to wingtip is the most common form, though there are other variations. They usually aren’t much more than two feet across, and they don’t have much surface area for decoration. They can be temperamental, and getting one to be consistent takes some patience and care. Once you get a fighter kite in the air, you are rewarded with a lively little dragster that responds quickly to your inputs, moves with unmatched speed, and changes direction in an instant. It is designed to be unstable on a slack line, and stable on a taught line – the secret to the kite is it’s flexibility. A fighter kite is the high performance race car of tethered flight. When you fly one on a short line, it is quick and reacts in an instant, when you fly on a longer line a fighter takes longer to react and becomes more tame – you can fly one in any way that fits your mood. A fighter’s motion can be hypnotic. The speed and adaptability of a fighter kite is part of it’s charm. While a stunt kite is always the same distance from the flyer due to fixed line lengths, a fighter’s single line gives the flyer options. You can fly on any line length you choose. Once you master the skill of flying one, that simple kite can be a source of great joy. I found fighter kites through a combination of curiosity and luck. It started with a kite catalog that interested me in flying kites. A fighter kite peaked my interest, but fighter kites aren’t commonly mass produced for sale in the west. In India and southeast asia, where they originated, the kites are made of bamboo and tissue paper, and flown on cutting line. The line is coated with rice paste and powdered glass, and when two lines come in contact, one is cut. 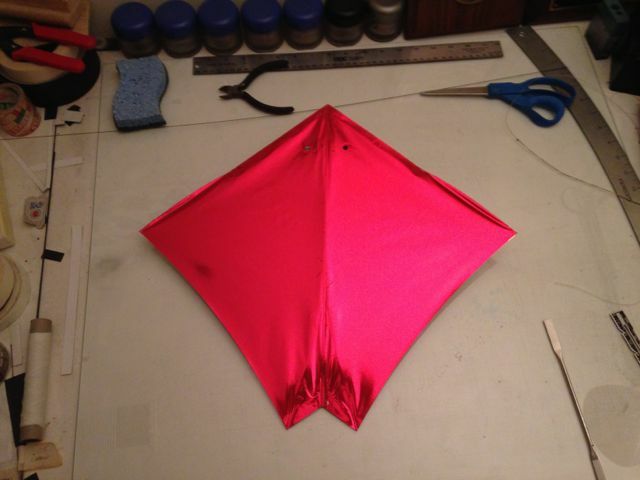 Therefore, the traditional fighter kite is commonly a disposable object. There aren’t many that are mass produced from fabrics or more durable materials. I found books about building them, and that had appeal to me, but I really began to understand them when I met a group that had just formed to build and fly them. Since that time, I’ve been a fighter kite specialist, and they’ve been a source of entertainment and joy for many years. I have flown fighter kites in competitions, I have flown fighters on cutting line and felt the joy of cutting and being cut, I have designed and built kites to fly indoors (you have to back up to keep the kite flying) and I have won prizes at kite festivals for my kites. That simple kite form has been very kind to me over the years. I enjoy designing and building fighters. I’ve always been proud to fly my own creations. I build my kites out of Mylar or Clearphane (a plastic film that is semi-opaque, a colored cellophane.) and I also use a material called Orcon, which is a lightweight, flexible ripstop plastic material that was once used as a vapor barrier in aircraft. I use graphite rods for my bows (the flexible spar from wingtip to wingtip) and bamboo for my kite spines. I build them with three point adjustable bridles so I can adjust the balance of the kite and adapt to wind conditions. I’ve been pleased with the results over the years. I don’t rush my kite building, but I can build one quickly in a few hours. I have experimented with sail shapes and materials, and I have my favorites, but in the end, they all produce the same result, a kite of speed, simplicity and pure joy to fly. The photos below are of a swallow-tailed fighter I call a Firefly. This example is made of mylar, using a bamboo spine, graphite rods for the bow and the tail battens, contact cement, packing tape to reinforce the places where the sail is under strain, and loose-leaf page reinforcements at the place where the bridle lines go through the sail to attach to the bow near the front of the kite. This example isn’t bridled yet, but in the sky it will be kinetic art. The front of the kite. Red mylar is very visible. The back side. Fighters are designed to flex.